Colony Worlds: Could Life Exist On Enceladus? Could Life Exist On Enceladus? While Earth is the only world known to harbor life in our solar system, several others may have some of the basic conditions for life--even tiny Enceladus. (Science @ Nasa) NASA's Cassini spacecraft may have found evidence of liquid water reservoirs that erupt in Yellowstone-like geysers on Saturn's moon Enceladus. The rare occurrence of liquid water so near the surface raises many new questions about this mysterious moon. "We realize that this is a radical conclusion -- that we may have evidence for liquid water within a body so small and so cold," said Carolyn Porco, Cassini imaging team leader at the Space Science Institute, Boulder, Colo. "However, if we are right, we have significantly broadened the diversity of solar system environments where we might possibly have conditions suitable for living organisms." Enceladus is one of the icy moons of Saturn, lying within the E-ring system. 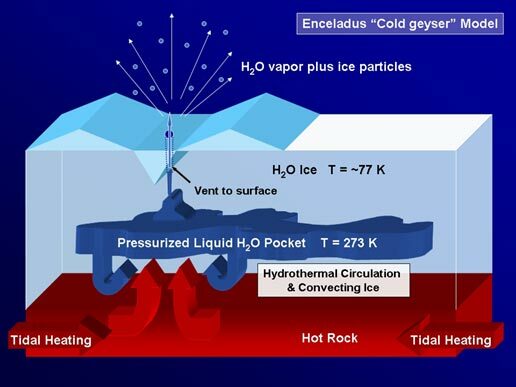 Unlike Jupiter's moons of Europa and Ganymede, Enceladus may harbor liquid water tens of meters below its surface (as opposed to several kilometers). But what surprised scientists was not the fact that this tiny world contained geyers, but rather the temperature readings from the surface. (Science @ NASA) High-resolution Cassini images show icy jets and towering plumes ejecting huge quantities of particles at high speed. Scientists examined several models to explain the process. They ruled out the idea the particles are produced or blown off the moon's surface by vapor created when warm water ice converts to a gas. Instead, scientists have found evidence for a much more exciting possibility. The jets might be erupting from near-surface pockets of liquid water above 0 degrees Celsius (32 degrees Fahrenheit), like cold versions of the Old Faithful geyser in Yellowstone. If this is true then that means that bacteria (and other organisms) could survive beneath the icy crust of Enceladus, protected from the vacuum of space. Even if life is not discovered on this small world, it would mean that future colonists could exploit Enceladus's underground oceans and perhaps develop oceanic colonies instead of building on the surface. Want more space geek news? Then subscribe below via email, RSS or twitter for free updates! Prefer another service? How about via RSS or follow Colony Worlds on Twitter! You can either visit the stars or watch them from afar. But if you choose the former, you'll definitely get a better view. Note: You do not need a Blogger account in order to comment, but you do need to solve the universal puzzle below. Discussing reasonable ways to colonize our Solar System. Slamming Ice Into The Moon? Magnetic Sled Hurling Objects Into Space? Flashy Goggles To Combat Space Sickness? Chinese Space Station In 2008? Colonizing Mercury, Could It Be Done? Opinions expressed here do not reflect the views of anyone that I work with, for, or associate with in any manner.